If the big day is closing in and you want to get a wedding cake, then you need to know that the price will usually vary depending on multiple factors, like the geographic region you live in, the baker you employ, the type of cake you need and the number of guests you’re expecting. Statistics show that an average wedding cake will cost around $550. You will be usually charged per slice at most bakeries and pastry chefs. You will usually pay around $1.50 per slice for a small cake in usual vanilla or chocolate flavors and with little to no decorations. A medium sized cake with some decorations and standard flavors like lemon poppy seed, vanilla or chocolate will cost around $5 to $6 per slice. A big cake, professionally decorated, built on multiple tiers with a gourmet look will cost at least $10 per slice, if not more. Depending on their complexity, decorations could drive the price per slice up. One of the least expensive and easiest decorations are real, fresh flowers. If your dream cake is one covered in fondant, then you must know that it usually drives the price per slice up by around $1. If you’re looking for complicated or out of the ordinary fondant decorations, they will add even more to the final price. You’ll also pay more for dried fruits, special cream fillings and cakes with nuts. The price could increase by $1 per slice. If the cake you’re buying is a big and expensive one, then you should ask to be delivered at your wedding location. The price per delivery is usually $50 to $100 or even more, depending on the distance between the bakery and the place of the wedding and on the size of your cake. Ask if the bakery of your choice can cut the cake in advance. Some caterers charge $1 extra per slice in cake cutting fees. Before looking for a bakery, check if your caterer can also make the cake for you. Big catering companies are also able to make cakes or have discounts with bakeries and pastry chefs. Like with most wedding preparations, booking a bakery in advance will surely help you get a cheaper price for your cake. Look for new chefs or bakeries, because the well known ones usually have a bigger price. Look for discounts and offers at your local bakeries. You could spend less on the cake if you use just one tier of real cake and the rest of the tiers fake, made from icing or Styrofoam. Should the average working couple have a cake at their wedding? The cake is a great way of showing that your wedding is an important celebration, a joyful moment of your life. 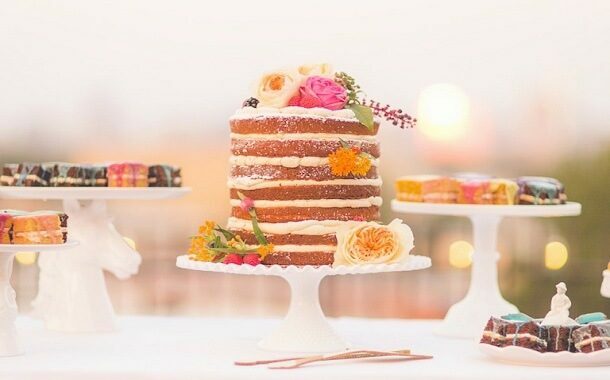 It’s very hard to imagine a wedding without a colorful and tasty cake. Even if you’re on a tight budget, don’t underestimate the importance of the cake and don’t try to make it yourself or ask a relative or friend to make it for you. A professional pastry chef or bakery will turn your cake moment into a great memory for everyone. Don’t forget to arrange as many cake tastings as possible before picking the baker you’ll work with. There are a few professional bakeries that offer free tastings so be sure you take advantage of those. Check the chef’s or baker’s portfolio and references before ordering. Booking your favorite baker in advance will not only get you a better price, but will also assure you that they will be available for the date of your choosing. How Much Does Dog Vaccination Cost? How Much Does a Car Tune-up Cost?